In 2005, Deborah Nelson joined forces with military historian Nick Turse to investigate an extraordinary archive: the largest compilation of records on Vietnam-era war crimes ever to surface. The declassified Army papers were erroneously released and have since been pulled from public circulation. Few civilians have seen the documents.The files contain reports of more than 300 confirmed atrocities, and 500 other cases the Army either couldn’t prove or didn’t investigate. The archive has letters of complaint to generals and congressmen, as well as reports of Army interviews with hundreds of men who served. Far from being limited to a few bad actors or rogue units, atrocities occurred in every Army division that saw combat in Vietnam. Torture of detainees was routine; so was the random killing of farmers in fields and women and children in villages. Punishment for these acts was either nonexistent or absurdly light. In most cases, no one was prosecuted at all. 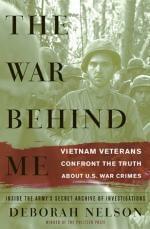 In The War Behind Me Deborah Nelson goes beyond the documents and talks with many of those who were involved, both accusers and accused, to uncover their stories and learn how they deal with one of the most awful secrets of the Vietnam War.